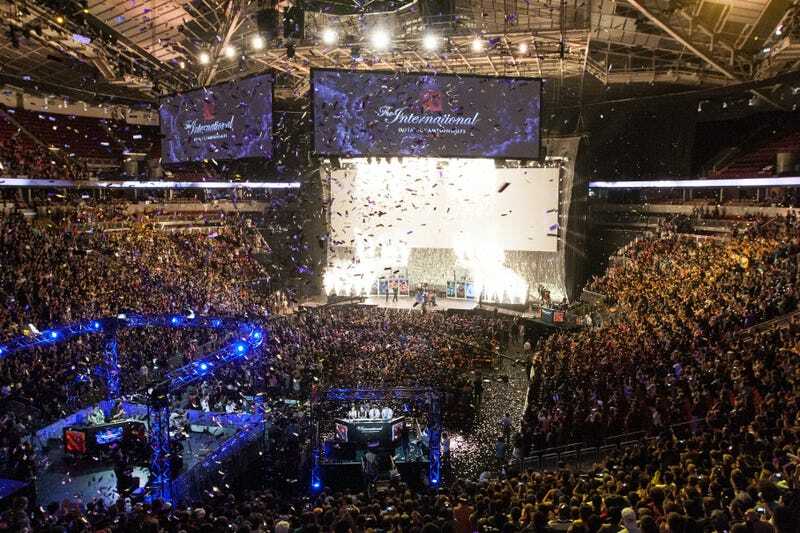 Dota 2’s annual championship, The International, has the biggest prize pool in all of esports – $21 million and counting. Unlike Overwatch League or the League Championship Series, The International doesn’t rely on big-name sponsors or media rights. Instead, it is almost entirely crowdfunded by fans, putting a democratic twist on professional gaming despite its massive scope. For fans, it’s the ultimate celebration of Dota 2, unsullied by corporate greed, even as it manages to pump more than $20 million into the game’s professional scene annually. But there’s another side to The International, one that makes Dota 2 a harsh place for tournaments, teams, and (most) players to scrape out a living. For all The International’s charms, there’s a lot of evidence that Dota 2’s premiere event is hurting, not helping, Dota 2 as a whole. It’s about money. Esports ecosystems are complex, and the business interests of their participants (players, teams, tournament organizers, publishers, etc.) aren’t necessarily aligned. Tournaments make money one way; teams do another. Ideally, these business models wouldn’t work against each other, but in practice, they often do, and one way of understanding the history of esports is as a series of attempts to bring these interests into alignment. Franchising, as seen in League of Legends and Overwatch, is one strategy for doing so, though it comes with strengths and weaknesses. But Valve is up to something very different with Dota 2. Though The International has always been the most important tournament in Dota 2, its relative importance has grown in recent years. From 2011 to 2016, as more third-party tournaments entered the scene, the percentage of the total annual Dota 2 prize pool concentrated in The International fell from 96 percent in 2011 to 55 percent in 2016. Over the last two years, however, that number has crept back up. In 2017, The International made up 65% of the winnings in Dota 2, and this year’s numbers look similar. This makes it increasingly hard for third-party tournaments to gain relevance in the eyes of fans and players alike. Third-party tournament organizers like ESL and Beyond The Summit also no longer have the same options they once did for generating revenue due to changes in Valve’s policies. For years, such companies were able to use their own crowdfunding tools, like International-style compendiums and tournament-branded virtual goods, to boost their prize pools and allay the costs of putting on an offline event. But, in 2016, Valve stopped granting tournaments permission to do so. Tournament organizers and fans have different theories on why Valve implemented this rule, but the simplest answer is probably correct: year-round crowdfunding for third-party tournaments takes some of the allure away from the crowdfunding for The International, the event from which Valve profits most handsomely. When Dota 2 fans look at the consistent year-to-year rise in The International’s prize pool, many interpret the rising number as “growth” for Dota 2 in general. But, given the game’s declining player-base and income, there isn’t much evidence to suggest that the pie is growing. Rather, Valve is just taking a bigger percentage of the pie for itself. Out of context, that might look like growth, but it’s actually just capital accumulation. This dynamic also presents challenges for would-be team owners in Dota 2. Unlike franchised esports, Dota 2 has a very low burden of entry. Prospective team owners in League or Overwatch must raise millions for a franchise slot and agree to all kinds of rules about branding, staffing, and minimum compensation. But nothing is stopping anyone founding a Dota 2 organization right now, and paying the players whatever the hell they want. Yet despite the ease of entry to entry, few investors see Dota 2 as an attractive proposition. And The International is a major part of that. Because its prize pool is so large compared to what’s available the rest of the year, players are incentivized to pursue winning in Seattle (or, this year, Vancouver) at the expense of everything else, including the organizations that sponsor them. Players’ tendency to jump ship is a year-round threat, despite the piecemeal rules Valve has instituted over the years to dissuade them from doing so. The problem is most visible in May during regional qualifiers for The International. Teams that do not earn a direct invitation tend to implode, trading around players in a mad scramble to assemble a lineup for regional qualifiers. No other premier esport suffers this degree of instability, which is not a coincidence. It’s the natural consequence of the Dota 2 scene’s (lack of) structure. It’s easy to blame the players for what might look like short-sightedness, but it’s more complicated than that. Dota 2 players have found themselves caught in what is effectively a version of the Stanford marshmallow experiment, in which kids got offered one marshmallow right away, or two if they could manage to be patient. Modern recreations of the study have shown that it is not willpower but socioeconomic status that shapes a subject’s choice. This plays out in the Dota 2 scene, too. Players caught in precarious positions will almost always prioritize short-term gain (prize winnings, especially The International) over long-term stability. Defenses of the status quo in Dota 2 often point out that 49 of the 50 highest-earning professional gamers in history made their millions in Dota 2, almost entirely because of The International. When it comes to total compensation – winnings plus salary – Dota 2 players have the most money available to them in esports. But Dota 2’s monied upper crust shouldn’t present us from looking into the financial health of players outside of the top. Esportsearnings.com has been tracking prize winnings in Dota 2 since 2011, and while it’s an imperfect tool, it does a decent job of tracking the lifetime earnings of Dota 2 players. Among the top 500 players (a passable approximation of anyone who has ever played Dota 2 professionally), the average lifetime prize winnings is $288,196, or about $41,167 per year. That’s not luxurious, but it could be worse. The median earnings, however, tell a different story: the median earner, Julius “Julz” Deleon, has earned $39,041 since 2013, when he joined his first professional team, or $6,506 annually. Now, Julz might not be the best hard support in the world, but he is better than 99.95 percent of players. And yet, in terms of prize money, he is making what amounts to poverty wages in much of the developing world. What’s more, of the $144 million in prize money awarded since Dota 2’s release, a full fifth ($29 million) has gone to a mere 10 players, and the long-term trend in Dota 2 is more money ending up in a dwindling number of hands. The concentration of wealth in the Dota 2 economy, in other words, looks a lot like the concentration of wealth in general at our present moment of historic inequality. That said, prize winnings are only one part of a player’s total compensation, and monthly salaries are supposed to provide stability to players. But if salary data could be included along with prize winnings, the difference in total compensation between elite and average pros would likely be more unequal. Team Liquid, for example, told The Verge that player salaries range from $100-$200,000 per year, and that’s on top of their share of the winnings from The International, which they won last year. The only teams that can afford salaries like that are the ones that are already winning, since no one wants to sponsor or invest in a losing team. Teams without dependable salaries are at a massive structural disadvantage, hurting their ability to practice effectively. Among poor teams, it’s not unheard of for multiple players to share a room, on couches, or air mattresses. Besides the obvious problems posed by a poor night’s sleep, this stressful situation can create team-destroying interpersonal conflicts. Food security, too, remains an issue in Dota 2’s tier two scene. In his (ignored) appeal to Valve for mercy, SmasH noted that his team ate cereal for most meals. Elsewhere, the Filipino team Rave once announced on its Facebook page that the team had at one point subsisted on eggs: “no win means no allowance for [the players], there was a time wherein they literally have to eat egg for a week just to save money.” In context, this story was intended to be read sign of how much adversity Rave overcame. But it’s also symptomatic of a system that is failing the people who make it possible. The International didn’t produce this entire tangle of problems, nor can they be reduced to a single cause. They are systemic, and emerge from the interaction of different parts of the Dota 2 ecosystem over time. The International is not helping, though. It appears to be making the situation worse. The incentives of players, teams, tournaments, and Valve are not aligned, and The International consistently pushes them further out of alignment. Until that changes, there’s little reason to think that Dota 2 will stop being unstable. On its current trajectory, the only real winners in Dota 2 are a handful of elite teams and Valve. Everyone else—tournaments, teams, and all but a few players—has to fight for scraps, or leave. But another Dota 2 is possible, and it is largely up to Valve, which could regulate this ecosystem if it chose to. This is the bitter irony of Valve, a company that makes a big deal about its “hands off” approach to esports compared to Blizzard and Riot, yet is nevertheless the center of the Dota 2 scene thanks to The International. Fixing Dota 2’s problems wouldn’t have to mean doing away with The International. In fact, the most effective tool Valve has to better regulate Dota 2 is the The International, which could break the cycles it currently perpetuates. Valve could consider earmarking crowdfunding from The International for future use, funneling it to smaller tournaments, like Peter “PPD” Dager’s newly-announced North American Dota Challenger League. (Blizzard used a similar strategy to revive StarCraft II’s flagging esports scene. Crowdfunded “War Chests” not only increase the prize pool of premier tournaments, but set money aside for smaller ones as well). Altering The International in these ways would, in all likelihood, take some of the luster off of the tournament and ask sacrifices of Valve, whether in the form of tempered (short-term) profits or an expense of labor. But it would set the game up for long-term success. In its current form, The International is an antagonist to the best version of Dota 2’s future, the one that supports the most players possible, building the quality of competition for years to come. If Valve focused on the long-term health of Dota 2’s esports scene, then maybe pro players would be able to focus on that, too.